It's been an up-and-down season for the Eastern York football team, but the Golden Knights still have a shot at a share of the YAIAA Division II title. Going into the final week of the regular season, the Golden Knights are just a game behind York Suburban, which has already clinched a share of its second straight title. With the teams set to play at Eastern York at 7 p.m. Friday, the Knights have control of their own destiny. But while Eastern York (4-5, 4-1) has made improvements in coach Jeff Mesich's first season, the Trojans are as hot as any team in the YAIAA. York Suburban (7-2, 5-0) has won seven in a row and hasn't lost since the second week of the season. If Eastern York secures a share of a division title for the first time since 1990, it'll have to slow down a York Suburban team averaging 35 points per game during its seven-game win streak. The Trojans don't have as much firepower as they did last season with all-time YAIAA passing leader Thomas Merkle, but new quarterback Ben Igo is third in the league in yards and has played well lately. And while the Trojans will likely have a spot in the District 3 playoffs, Eastern York will be playing its last game of the season Friday. Ending it with a championship would be very satisfying for this young Knights squad. The Skinny: The Eagles can lock up a spot in the District 3 Class 3A playoffs by beating the winless Canners. Eagles (7-2, 5-1) must: Avoid complacency. Bermudian Springs has district title hopes, but the Eagles need to make sure they take care of business before they start thinking about the playoffs. Canners (0-9, 0-6) must: Get off to a fast start. Bermudian Springs has started slow a number of times this season. If Biglerville can go into halftime with the game close, they might have a shot. Last year: Red Lion, 26-0. 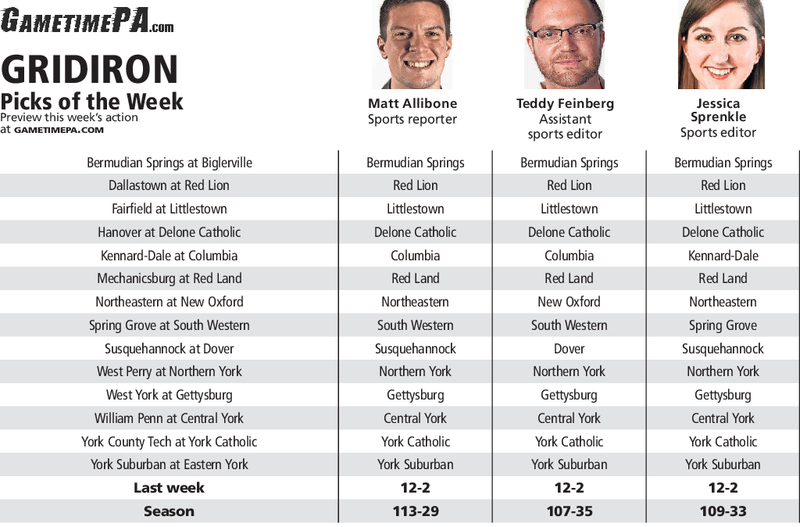 The Skinny: The Lions are gunning for an undefeated season against a Dallastown team still trying to lock up a District 3 playoff berth. Wildcats (7-2, 4-2) must: Slow down the Red Lion running game. Dallastown kept Central York's Noreaga Goff in check last week, and will have to give a similar effort against a Red Lion offense led by back Dyan Gurreri and running quarterback Sam Emig. Lions (9-0, 6-0) must: Stay balanced on offense. If the Lions can continue to supplement their ground game with a formidable passing attack, they'll be hard to stop. The skinny: Both teams can boost their playoff hopes with a win. Fairfield is clinging to the final spot in Class 1A while Littlestown is third in the four-team bracket in 3A. Green Knights (4-5, 1-5) must: Figure out something on defense. Fairfield has given up more than 40 points four times during its five-game losing streak and now faces a Littlestown team with a plethora of weapons. Thunderbolts (7-2, 4-2) must: Avoid turnovers. The Bolts were hindered by four interceptions and a lost fumble last week against Bermudian Springs. The skinny: While the playoffs are out of reach for both teams, the intensity should still be high for this rivalry game. Hanover can clinch its second-straight winning season with a victory. Nighthawks (5-4, 3-3) must: Stop Delone's rushing attack. The Squires have been one-dimensional on offense most of this season, relying on running backs Zach and Ryan Hart. Hanover will need to get penetration against Delone's strong offensive line to slow them down. Squires (6-3, 3-3) must: Avoid giving up big plays. Hanover quarterback Cam Mumma returned from injury last week against Biglerville and played well. The Squires can't afford to give up long touchdown receptions like they have at times this season. The skinny: Somebody has to win. Can the Rams avoid a winless season in Chris Grube's first full year as head coach? Rams (0-9) must: Avoid giving up scores on special teams. The Rams have a shot to win this one, but they can't make things difficult for themselves by giving up return touchdowns like they have in recent weeks. Crimson Tide (0-8) must: Run the ball. Kennard-Dale has struggled to defend the run all season. Last year: Red Land, 48-16. The skinny: The Patriots can clinch a winning season by beating the struggling Wildcats. Wildcats (0-9) must: Try to slow down Justin Johnson. This one's easier said than done. The Red Land running back is one of the most explosive players in the county. Patriots (5-4) must: Avoid mental mistakes. The Patriots are the clear favorites, they just need to take care of business. The skinny: The Bobcats can wrap up their second-straight 8-2 season by beating winless New Oxford. Bobcats (7-2, 4-2) must: Keep running the ball. Northeastern has a couple of talented running backs in Anu Johnson and Chris Whack, and New Oxford has been weak against the run all season. Colonials (0-9, 0-6) must: Get Tanner Miller going. The senior quarterback is the brightest spot on the Colonials and is capable of breaking long runs. The rest of the team will have to give him some help, though. The skinny: Neither team is in the playoff hunt, but this matchup remains one of the area's most intense rivalries. Both teams are looking to avoid losing seasons. Rockets (4-5, 2-4) must: Find consistency on offense. Spring Grove has scored just seven combined points the last two weeks without leading rusher Ryan Daugherty. Mustangs (4-5, 3-3) must: Cut out the fumbles. South Western struggled on offense in general last week in a 31-0 loss to Northeastern, but the Mustangs made things worse by losing two fumbles. The skinny: Both of these teams have struggled this season, but the winner of this game will finish strong on a two-game wining streak. Warriors (3-6, 2-3) must: Win the battle in the trenches. Both teams like to play conservative and run the ball. If the Warriors can control the line of scrimmage, they'll have the upper hand. Eagles (3-6, 2-3) must: Stop Jack Allred. Susquehannock's bulldozing fullback has carried the team's offense all season and has over 1,200 rushing yards. The skinny: Currently one spot out in the District 3 playoffs, Northern York can put itself in good position with a win over West Perry. Mustangs (2-7) must: Get their defense on track. West Perry has given up 50 or more points in two of its last four games. Polar Bears (6-3) must: Keep spreading the carries around. Kyle Swartz, Curtis Robison and Jordan Oliver all ran the ball at least seven times last week as Northern York rushed for 185 yards in a 34-0 win over Greencastle-Antrim. Last year: West York, 44-22. The skinny: If it wins, Gettysburg can end its bounce-back season with a winning record. West York is simply playing for pride. Bulldogs (2-7, 2-3) must: Find success throwing the ball. Corey Wise threw for 223 yards in a win over Susquehannock two weeks ago, but he was inconsistent last week as West York scored just seven points against Dover. Warriors (5-4, 3-2) must: Get Edny Celius going. The senior has cracked 1,000 yards rushing this season but was held to 47 last week against York Suburban. Last year: Central York, 42-0. The skinny: William Penn is flying high after earning its first win since 2014, but the Bearcats now face a dangerous Central York team looking to wrap up a playoff spot. Bearcats must: Avoid turnovers and penalties. William Penn scored 62 points last week despite losing five fumbles and having multiple touchdowns called back. Those mistakes will haunt them against Central. Panthers must: Slow down Dayjure Stewart. The Bearcats running back scored four touchdowns of 58 yards or longer last week. Last year: York Catholic, 56-8. The skinny: The Fighting Irish can clinch sole possession of the Division III title by beating a York County Tech team that is talented but coming off two straight losses. Spartans must: Get their passing game clicking again. Quarterback Josiah Smallwood and receiver Jordan Ray are dangerous, but the pair were unable to put up any points last week against Delone Catholic. Fighting Irish must: Keep pounding the ball. York Catholic has one of the league's biggest offensive lines while the Spartans are young and undersized on the defensive front.